The kit is a re-issue of ICM’s AMD 35 Armored Car, in Tamiya boxing, with Tamiya decals and instructions manual and a single add-on sprue from the Japanese manufacturer. The kit arrives in a typical Tamiya box, although this seems to be a little too big for the contents. The box art consists of an artistic rendering of the completed model in olive drab overall, adorned with French roundels. The ICM sprues are packed all together in a single tight bag which led, in my case, to noticeable warping of the larger sprue – Sprue C. Tamiya items are packed individually and such better protected. The instruction manual is printed in the usual Tamiya style in grayscale, on A4 format booklet. The first page depicts a black and white copy of the image from the box art, followed by a quadri-lingual (English, German, French and Japanese) short history of the vehicle. The upper side of the second page is reserved to technical advices, color chart. Because there is no sprue layout, a list of unused items is also included. At the bottom of the page is represented the first step of the building (see infra). Pages 2 thru 10 include diagrams of the assembly. Pages 11&12 contain information about the painting schemes and the application of decals. The decals are printed in good registry, with excellent colors. The carrier film is cut very close to the printed edges, but they are a little thick and the edges visible. The transparency and adhesion are excellent. Sprue A (ICM) x 1: All ICM parts are molded in the brown stiff plastic characteristic to ICM products. Personally, I found it very pleasant to work with. Sprue A contains the bottom plate, lateral exterior plates and other small items belonging to the body shell. Also molded on this sprue are the two halves of the engine. Sprue B (ICM) x 1: interior floors, bulkheads, doors, front plate and read deck. The rear deck is molded with one hatch shut so only one half can be represented open. Sprue C (ICM) x 1: turret halves, armament, ammunition and the whole horde of small parts to complete the engine and the interior detail. Sprue E (ICM) x 1: the wheels. All ICM parts are very well molded, with excellent detail definition. A very fine parting seam can be encountered along a few parts, but very easy to clean except when on the leaf springs and smaller parts. Sprue Y (Tamiya) x 1: the sprue shows a stamp on the back with the original year of release – 2007 so I assume it was initially conceived for another kit and adapted to ICM kit. The sprue comprises parts for two fuel drums, three non-descript wooden cases, two rolled-up canvases, lower part of a figure with optional helmets and a pair of sunglasses. The parts are molded in dark green soapy plastic. The detail is good and the fit is perfect. The leather jacket of the figure looks a little suspicious to me but I’m not sure how will work under painting and weathering. The rolled-up canvases have difficult to remove seam lines at the ends. Tires (ICM) x 4: ICM provides hollow tires injected in vinyl for this build. The rubber is rather stiff and the weighted look cannot be achieved without lesting heavily the vehicle. The tires have good thread pattern and reasonably accurate for what I could see in the war time photographs. There is no detail on the tire walls. Clear parts: the kit contains none. Photo-etched parts: the kit contains no photo-etched parts. There was love at first sight between ICM and I. A few years back, when I returned to model making, my first choice was an Opel Admiral Cabriolet in 1/35 scale from the Ukrainian company. I enjoyed it tremendously with all the difficulties encountered given my lack of practice and hibernated skills. Their Mercedes G4 followed suit and made the subject of one of my first features published some three years ago here on Kitmaker Network. Then I kept buying ICMs but I never wait to build another one before waiting for my skills to mature a little more, as these kits deserve. But, as usually happens, I’ve got drawn in another directions and I nearly forgot about my first love, until ICM released the AMD-35. I wanted to buy it right away, but then I got hold of myself and decided to build first at least one from my stash before I buy yet another one; and that never happened. When I saw the kit available for review I just couldn’t resist anymore and I made a request which Darren Baker granted. Only upon cutting the first pieces from the sprue and making the first glue joints I realized how much I had wanted for all those years to build another ICM kit. I am mightily glad I put in the request and I kept the promise to myself: I bought an ICM with the very first order even before completing this build: 1/24 Opel Admiral Cabriolet. Being such a well detailed kit, I knew a good plan has to be laid even before attempting the first cut. The problem is that I don’t like open doors and hatches that much, not being a diorama builder; but even so, I almost always paint the unseen detail – just as good practice and to deal with that “I don’t see it but I know is there” feeling. Choosing the exterior paint scheme was also a harsh decision; normally I wouldn’t hesitate to make it Panzergrau. Yet a small detail in the title caught my attention: 1940. So even if the Germans managed to capture few examples that early, it seemed unlikely to me that they were systematically pressed into service. The painting guide from Tamiya manual confirmed that. Decals with the Wehrmacht crosses are provided, but it is recommended by the manufacturer that the car should be painted French olive drab, even if operated by Germans. That decided the matter for me, and French khaki it was. As for the interior, I was unable to take a definite decision. Eventually, considering that the main objective of this build was the kit’s review in full, I went to paint it entirely, interior and exterior and I think it was a very good decision after all. As for open or closed hatches, I was undecided until the very last phase of the build; the fact that the turret proven slightly warped and forced me to build all the hatches closed the decision was made for me: all shut-up. Generally speaking, I followed the manual, altering things only to easy the painting process or to protect external small parts from accidents. Step 1 - Floor. The attachment of the floors to the lower hull plate it’s easy and straightforward; no difficulties here. Step 2 – Interior: the bulkheads are attached in this step, delimitating the internal space of the vehicle. For some reason the transversal bulkhead leans towards the engine room more than it should and that gave me minor troubles later on. The longitudinal bulkhead with the fan assembly went in perfectly. Step 3 – Engine: the engine is a little gem and a perfect platform for super-detailing. No troubles whatsoever here, although the assembly contains some ten pieces. Step 4 – Steering wheel(s): that was a little surprise for me: judging by the external looks, I never expected AMD-35 to have a co-driver. Very easy assembly there. Step 5 – Attaching steering wheel: A well detailed diagram let no space for error. The fit is superb. Step 6 – Side panels: it was by far the most complicated step that far, dealing with all the small parts attached to the walls: fire extinguisher, intercoms, spare weapon and spare ammunition drums. Besides, the panels have their own plumbing / wiring detail, molded pretty much in the manner of aircraft kits that need to be detailed. A minor problem here are the locator pins in the back of ammunition drums: they are thinner and longer than the wholes meant to accommodate them. I’m not sure if that is a minor error from the manufacturer or it was made in purpose. If they are glued that way, a small space remains between the side panel and the drum. I chose to glue them like that, holding every drum individually in position until the glue set; otherwise they have the tendency to lean in awkward angles. The easier alternative is to cut the pins and to glue the drums flash to the panel. Step 7 – Attaching side panels: this is again a rather complex step, since the side panels need to match the lover plate and the bulkheads. It was now that I discovered the leaning bulkhead. I had to abuse a little the use of glue and I clamped the assembly to dry overnight. Also on this step more small details (driver pedals, levers, spare ammunition for the 25 mm cannon) are added, all of them free of trouble. Step 8 – Front section: the front plate (part B6) had a little warp to it and I needed to tape it firmly in its location. Once glued in place the fit is perfect. The following part to join the assembly, A3, entered actually with a “click”, so good the fit went. The only location where the alignment isn’t that perfect is at the sides of the driver’s visor. That was the only place I ever used a drop of filler in this build. Step 9 – Rear section: All panels fitted exemplarily here. The co-driver hatch, however, needed the hinges removed to fit. I guess the ICM team have considered only the “open” option. Again, minor problem, hardly worth to mention. Step 10 – Chassis undersurface 1: Some underside panels were attached here, as well as suspension and transmission parts. All easy and without stress. Step 11 – Attaching differentials: minor problem here again with the fit between parts C52 and C59, leading to a hair thin gap across the transmission axle. I chose to transform this into a feature, painting the axle and the differential casing in slight different colors, making the gap to appear as a natural joint line between the parts. In the same manner were treated the gaps between parts C49 and C50. Step 12 – Chassis undersurface 2: Few small details are to be attached here; additional diagram from Tamiya ensures the assembly goes error free. Step 13 – front wheels and rear wheels: the build of each wheel is detailed separately with additional diagrams – very neat from Tamiya! Step 14 – Attaching wheels: it looks like a simple step, but for me was the most troublesome from the entire build. I’m not sure if it was me or the kit, but the parts C15 and C24 just didn’t fitted as they should and I had to tear them apart and re-glue, ignoring the angle of the locator hole at the back of the wheels (?). Step 15 – Attaching rear parts: easy step. I skipped the attachment of the pioneer tools because I wanted to paint them separately, and attach them after the painting / weathering process of the vehicle was done. Step 16 – Attaching rear rack: the modeler has here the option to attach the rack extended or stored. If extended, parts Y4 and Y5 can be added. That was my initial intention too, but after I realized that part Y4 will hide the rear license plate, I placed it on a different location. Step 17 – Attaching engine access hatches: is another easy step. No problem here but the handles of the hatches seem to be a little over-scale which doesn’t really bother me. Step 18 – Doors: As the side panels, the doors are teeming with detail begging to be exposed. I left the exterior handles for last, being afraid that I may damage them during painting / weathering. Step 19 – Attaching doors: That was easy as it sounds. For not being yet sure how I was going to display the model, I glued the doors with white glue for final painting. Step 20 – Attaching cannon: although the cannon itself contains only four parts, the assembly is quite well detailed and make an interesting piece. The barrel is molded in halves but only the muzzle is hollow – a clever way to keep the assembly’s rigidity and to provide a good looking piece in the same time, without making use of slide molding. The coaxial machine gun is also nicely detailed, but unfortunately the molding quality lets to be desired. The mold’s halves didn’t matched well and a shoulder is prominent along the part. Fixing the part is a rather delicate process and I’m not all that sure that I’ve done the best of jobs there. Nonetheless, I replaced the barrel with a section of stretched tube. Part C55 was also a bit off the mark and threw slightly the sub-assembly off the axe. Step 21 – Turret: the attachment of the internal details of the turret and its ring. Not a complicated business at all, but I had the feeling that the detail is over-simplified here. Step 22 – Attaching hatches: That was the step that determined me to display an all closed model, because the doors frame is warped and without the doors closed there is no way to coerce it in the right position. I noted also that the turret in the middle of sprue C, the one warped due packing mode and I think the molding was initially good. It’s a shame that the packing damages instead of protecting the parts! All the other parts installed nicely. Step 23 – Attaching turret: The fitting of the turret with the lower compartment is very tight and some paint was scratched in the process. Fortunately the damage isn’t visible with the turret in place. Stowage items: Since I was doing a monochrome vehicle, I considered that some additional storage will be welcome, to add more diversity to the building. I wasn’t particularly charmed by Tamiya’s rolled-up canvases, but I decided to use them anyways. The wooden boxes have some nice detail to them and I was not intended to build them when I have discovered some pin marks inside the lateral fenders at the front of the vehicle in a difficult to reach position, which I missed earlier. I decided to mask them by adding the crates, although the one on the left fender is obstructing the driver’s rearview mirror. If the modeler chose to open hatches and doors, then the generous interior offered by ICM is a gold mine. However, the only available option is paint-as-you-go, which suits me well but other armor modelers loathe. Tamiya recommends painting the engine room with “hull red”, probably the closest match from their paint range with primer red. However, I cannot judge if the recommendation it is correct or else; I couldn’t find any reference on the subject and the truth is that I didn’t dug too deep either. I mixed my own “red primer” from Krylon enamels and I was quite satisfied with it. At this stage I also decided to use the color as primer over the entire build, as the real vehicle would. A secondary reason was that my acrylic mix for exterior (see infra) had too much of a blue shade and I hoped I will achieve an optical mix to “brown it up”. The interior of the drivers compartments, fighting compartment and turret was recommended in white, but I knew already there is going to be too much of a contrast and I went for another own mix: Krylon white Model Master deck tan enamels. All went on nicely and without problem. The small details from the walls, seats and such I painted them with various acrylic mixes, mainly from Homefront range, except for silver, for which I used Model Master chrome silver. After everything dried up, I applied a light wash of LeFranc & Bourgeois “transparent brown” oil. All the exterior was primed with “red hull” own mix. During this process, I ignored my airbrush’s snorting and went on. In some places I had some splotches of thicker and darker paint which, rather than sanding, I “erased” with a cotton bud moist in lacquer thinner. I added this method to my “arsenal”, because worked out really well. I still need to try it on different plastic qualities before full “acceptance”. I re-sprayed afterwards the affected areas and all was nice and smooth, ready for the main coat of paint. The closest reference I had for mixing the “French” olive drab was Tamiya’s box art. I chose a mid-tone and matched it from Liquitex acrylics. I think the fluorescent light I’m using above my desk tricked me and I went too much into the blue shade. I “corrected” it with some orange and decided to use “red primer” as undercoat. I never had a problem using Liquitex acrylics and this time was no different. From the base color, I mixed some lighter tone by adding yellow and I sprayed the highlights on random pattern, mostly over the horizontal or raised surfaces, which naturally would catch more light. I mixed a darker tone by adding burnt sienna and black to the base and I post-shaded the recessed areas and the bases of the raised detail. I went a little too enthusiastically over the turret with the post-shading and the result was a turret from another AMD! I re-did the whole process, from base-coating to post-shading, over the entire turret, in more restrained manner and the result was more satisfying to my eye. I applied further a very light coat of Tamiya X-22 to protect the paint job, followed by a general light wash with Van Dyck brown oil paint from Van Gogh range. Another more consistent coat of X-22 and I was ready for decals. I am well familiarized with Tamiya’s decals and I quite know what to expect: good registered colors, nice semi-matte clear film. The downside is their thickness which makes the edges visible and if the following dry-brushing or washing catches those edges, the effect isn’t quite nice. Also they have a predisposition to silvering. No big problems encountered here, except for the front fender decal which is too big and covers some compound surfaces where not intended to. There I had to slice the decal to fit properly over the raised detail. The decal remained impassible to multiple applications of Micro Sol and Micro Set. To avoid the same problem with the tactical number, I applied it a dash higher than the instructions manual requests, avoiding the superposition with the row of rivets at the turret base. The other decal recommended (the split French roundel over the turret’s rear doors) I let it outside the build, because I was quite sure I cannot make it conform to the many rivets and latches molded there. My Mark Fit Strong just arrived too late. Fortunately I had no silvering at all and that was already good news. After the decals application, I covered everything with two light coats of clear satin polyurethane. I let the whole thing to dry for some 48 hours, and then I applied the pigments which I grated myself from artist’s dry pastel. I used mainly pastels from the brown range, with tweaks of yellow ochre and grey. For the exhaust muffler I used a random mix of orange, ochre and black patches. Some toned down black was used for exhaust stains, on the engine deck, and on the 25mm cannon’s muzzle. The kit is a definitely nice one. The box art is attractive, the instructions manual is well done, the molds are fine and crisp, and the decals are acceptable. And yet a sense of “incompleteness” persisted while doing this kit. The inside of the turret looks a little bare, Tamiya additions are OK but not that exciting, there is no sprues lay-out… Many various comments from the build blog and from the YT movies dedicated to this kit are pointing to the fact that Tamiya missed the only real improvement they could make to the kit: the addition of a lathe turned barrel, in the same manner they did with their Sd. Kfz. 222. I am endorsing this “general” opinion myself. I’m not a marketing expert, but I don’t see the point on re-releasing an AMD produced by ICM after ICM themselves “flooded” the market with at least three versions of the same kit and without consistent upgrades! Yes, the kit is a little gem, a superb base for super-detailing, and makes a beautiful display after completion but I think that ultimately all those qualities are being brought in by ICM, not by Tamiya. At least Tamiya are honest and display both on the box cover and on the first page from the instructions manual that: quote: “vehicle parts are product of ICM, Ukraine”. So, if would be for me to buy one ADM-35 kit, I’d buy the “original” one, naturally! Highs: Excellent interior and exterior detailing without the hassle of PE parts, very good fit with minor exceptions due warping, easy to correct and good instructions. Lows: Repetitive use OF subject. Great build and very useful step by step story... now I just have to follow you path. Or at least try to do so, because your art of painting is thousand miles ahead of mine BRAVO and thanks for this little Panhard ! Gabriel, You have convinced me to get this model and build it. Great review! Thank you for all the detail you wrote up. Good review Gabriel. Enjoyed watching the build too. 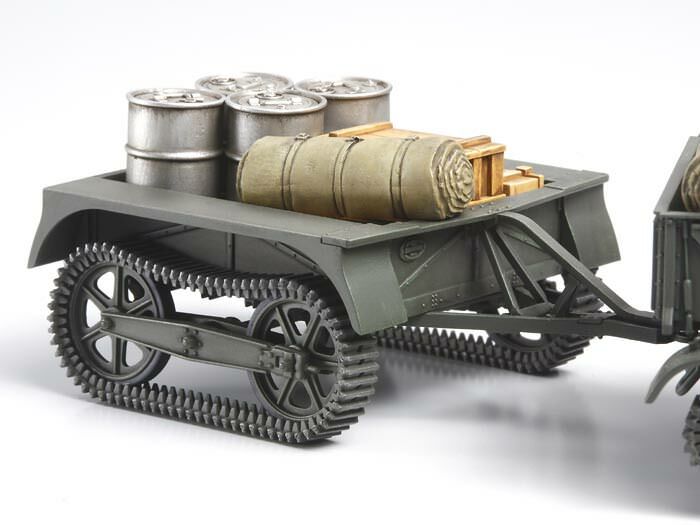 FYI, the additional Tamiya sprue was first issued with their Renault UE Carrier as cargo for the trailer the kit comes with. I enjoyed the review and while the ICM offerings are good value and well-detailed I can't help but be dismayed that Tamiya has seen fit to offer reboxings of Italeri and ICM kits, etc, instead of their own take on the kit. It is not as if the price was an ICM-level one. The inclusion of the accessories, unique decals, etc do little to add value to a kit that is now probably much more expensive than the original offering and begs the question of why I should buy the Tamiya offering and not the ICM one? st Miller, thank you! Well, practice is the only way I know. I wish you good look with your build and, if you have any question, please do no hesitate to post it. The compound modelling knowledge on Armorama is tremendous! Frederick, I'm glad you liked the review and yes, building this kit can be a very pleasant experience. The ICM released a version on railroad tracks as well. Peter, good info on Tamiya upgrade. Thank you! Does the trailer come with the Tamiya kit ?or is it aftermarket ? No trailer in this kit. The image was posted for demonstration by Pete. Bronco has released something nearly identical recently. Cheers! Gabriel.